Cornerstones is a Four Star Irish Tourist Board approved Bed and Breakfast, situated in the beautiful scenic village of Moyard. The Twelve Bens Mountain Range, a series of Lakes and the sea – Breathtaking beauty all of which can be seen from every room of our house, surround the area. Cornerstones is a modern built house with all the amenities to make your stay a comfortable and an enjoyable one. All our bedrooms are individually decorated with its own unique style and character. We are situated central to Clifden 6 miles, Letterfrack 3 miles, and Cleggan 4 miles. 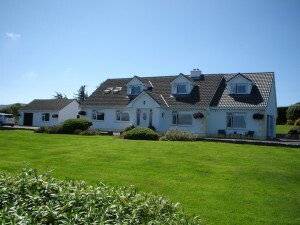 We are an ideal base for touring Connemara, Westport, Louisburgh and Maum Valley. Some of the scenery is conserved in the Connemara National Park, which is 3 miles from our house. Visit Kylemore Abbey (5 miles) where history is held time locked. Here you can find craft shops, Restaurant, Restored Gothic Church and the restored Victorian Gardens as well as visiting the Abbey itself. On arrival you will receive a warm welcome with Tea/ Coffee and fresh homemade baking from the kitchen.